Research and development is vital for every industry. Companies must innovate to keep up with the changing preferences of customers and rebuff competition. Innovation is critical for large consumer packaged goods companies in particular given the current market landscape. Incumbents are under attack from all sides as young startups create unique products that resonate with modern consumers. Additionally, costs for raw materials are rising, and it is increasingly difficult to increase profits within a business model that has traditionally focused on high-volume, low-margin goods. Big CPG firms need to increase their investment in and focus on R&D immediately. Change will not be easy, and it will take time to reap the rewards of these investments. However, this adjustment is imperative. Without it, companies will find that their days are numbered. Every CPG company employs R&D teams that are essential functions of the organization. Executive teams often champion R&D as the most crucial part of the company. Without it, products could not be created. 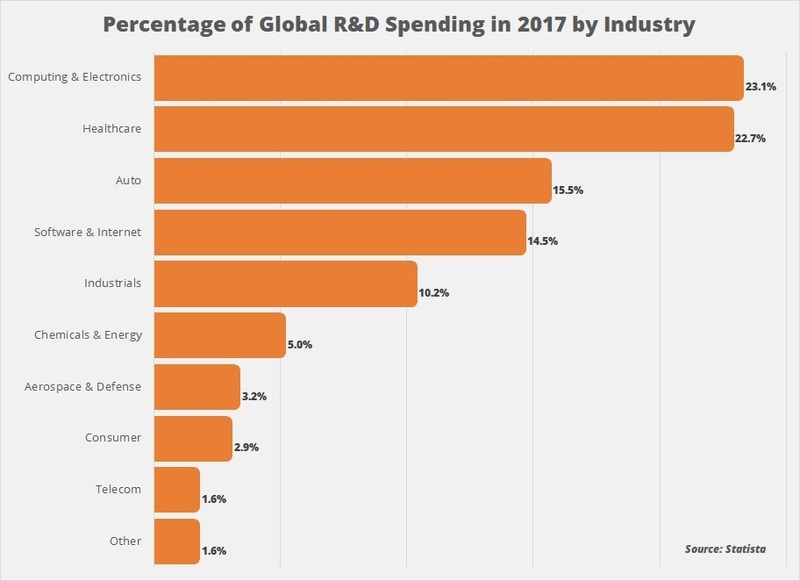 However, a noteworthy concern arises when we look at the amount of revenue invested in consumer products’ R&D divisions. Kellogg’s, for example, spent $148 million on R&D in 2017 – 1.1% of its net revenue. Google, on the other hand, spent $16.6 billion – 15% of its net revenue – during the same period. The chart below tells a much different story, however. 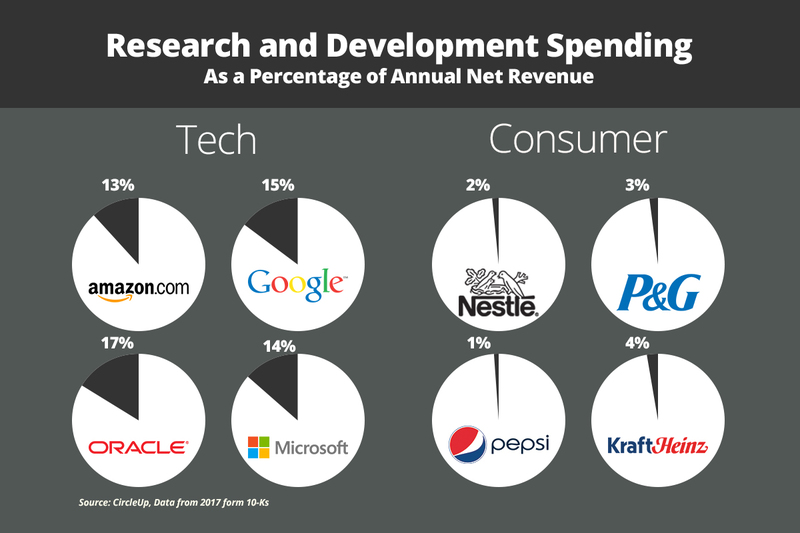 In 2017, Pepsi only spent 1% of its annual net revenue on R&D. The lesson? Even the best PR departments can’t stimulate real innovation. True innovation can only be achieved through a dedicated focus on and investment in research and development. Where’s the Love for R&D? Google, Amazon and Oracle are incredibly successful companies. They legitimately change the world with their constant innovation. With CPG firms struggling and tech thriving, why don’t CPG companies invest in R&D in the same way? CPG firms suffer from the innovator’s dilemma more than most companies, and it has led to the industry-wide paralysis that we see today. Expressly, the savvy decision-making that turned these brands into market leaders conflicts with the risk-taking necessary to capitalize on industry-changing ideas. The majority of CPG firms are public companies. According to GlobalData, 85% of the top 100 global CPG firms are publicly traded. Investment in R&D won’t pay off for many years. These companies provide quarterly updates to the market, so it’s difficult for them to take a chance on a groundbreaking new product that might not ever turn into revenue. On the other hand, a lack of risk is the reason for CPG companies’ dismal yearly sales increases. Limited investment in R&D leads to limited growth. There is a human-natured element to insufficient R&D spend as well. 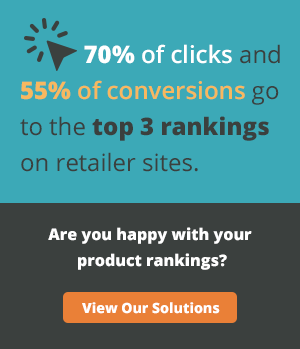 Big CPG firms are incredibly large, efficient and successful. Their erosion is so slow that individual employees often won’t take risks to protect a firm’s livelihood. Consumers are purchasing less Coca-Cola today, but they’ll continue to purchase it for the foreseeable future. It would be admirable for an employee to take the bold action necessary to save a 132-year-old company from failing 15 years from now. It’s human nature to accidentally let your organization fade into obscurity while you continue to collect a paycheck. Increase your R&D spend. Attribute at least 10% of your annual revenue to research and development. Take risks. Adjust your structure internally to become comfortable with and account for those risks. This increased risk will also create increased upside. Develop a plan for how to allocate these potential windfalls. Be sure to reinvest in genuine product innovation. Analyze where your R&D spend is allocated. Currently, CPG R&D costs are overwhelmingly attributed to product renovation, maintenance of current product lines, and efficiency. CPG companies are addicted to efficiency: decreasing costs and squeezing every penny of margin out of every product sold. This helps the company’s profits, but it doesn’t help grow overall revenue. Executives need to expressly earmark R&D spending for innovation. Furthermore, budget should be reserved for moonshot ideas. When noted, this will prevent long-maturing ideas from being squashed before they reach maturity. Without a focus on moonshots, new initiatives and products that deliver significant revenue multiples are nearly impossible. Create a broad framework for your research and development team. Beware that specific rules and unnecessary processes kill creativity. In this instance, a framework assures that employees are driving towards an organizational initiative that can eventually generate revenue for the company. Within that framework, give your employees permission to dream and create. Remove all limits within those initial broad confines. Stop focusing on product extensions. CPG firms are stuck in a rut launching new and improved formulations, flavors and packaging. These are often uninspired, lazy tactics to generate a small and short-lived bump in sales. Once an actionable R&D innovation plan is instituted, small product changes can be added in as an additional layer. Include R&D into the broader organization. Historically, many CPG companies have siloed R&D as a separate division of the business. Many are adjusting to the times, and that trend needs to continue. R&D cannot just be responsible at the front end for product development. They must work directly with Operations, Marketing, Consumer Insights, Finance, Tech, Legal and more. Share innovation costs by partnering with like-minded companies, creating incubators and accelerators. Sharing allows you to benefit from creativity outside of your organization. Additionally, your risk is limited, yet you can still find groundbreaking, industry-changing ideas. Investing in research and development requires a transformational shift within an organization and difficult changes throughout the business. However, an investment in R&D is an investment in the future of the company. In the current state of the CPG industry, these adjustments aren’t optional; they are absolutely necessary. Follow these notes, and you will institute genuine change within your organization to ensure that your company flourishes and prospers in this changing CPG landscape.